Browse: Home / Breast feeding with PIP Implants? Breast feeding with PIP Implants? As many as 100,000 European and 500,000 women worldwide received criminal, non-compliant PIP implants: the majority of these women are of reproductive age, a minority are recovering cancer patients. 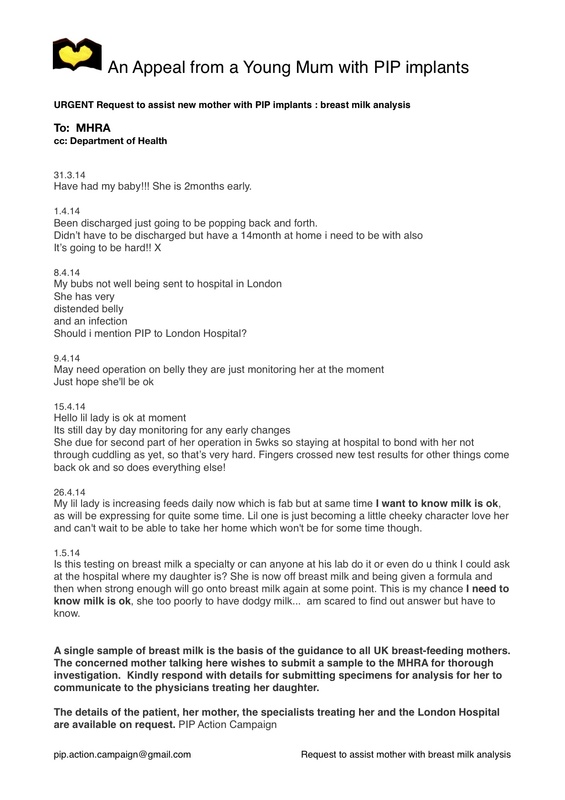 …current advice from the MHRA is that women with PIP breast implants should continue to breast feed their infants. In theory it is possible that the lower molecular weight siloxanes could migrate into breast milk; the MHRA have therefore arranged for chemical analysis of a sample of breast milk from a patient with ruptured PIP implants and we will publish the results as soon as they are available. The ‘results’ of the chemical analysis on breast milk were published in an Annex to the Keogh Final report seven months later. It has emerged that this analysis has not been peer reviewed and was conducted on a single subject! Why is it important for women with PIP implants to know about D4 in breast milk? Why is it crucial to protect pregnant women and children from EDCs? Until a couple of decades ago, scientists still believed that the placenta shielded cord blood would protect the unborn child from most chemicals and pollutants. However, studies which analyse the blood of newborn babies show that their blood already con- tains hundreds of hazardous chemicals such as heavy metals, flame retardants, dioxins, phthalates and pesticides. Many of the sub- stances that have been found in newborn babies are known to cause cancer, to be toxic to the brain and nervous system and are suspected to disturb the hormonal system. Thank you for offering to send in two breast milk samples for analysis, however, the MHRA is not planning to undertake further testing of samples of breast milk from women with PIP. Clinical experts we have consulted agree that PIP silicone gel breast implants would not pose any significant risk. There is also no evidence of any harm to breast feeding infants in women who may have experienced ruptures in their PIP implants. A single paragraph for nursing mothers, confirming low-levels of siloxanes have been found in a single subject. No identifiable increased risk for the nursing infant and no need for further study! Who are these people? The working group on PIP breast implants was appointed by the Department of Health to review the potential health risks of PIP breast implants and to advise the Department on policy in relation to women who received these implants. It was chaired by Sir Bruce Keogh, a cardiologist and NHS medical director, and consisted chiefly of plastic surgeons from the British Association of Aesthetic Plastic Surgeons (BAAPS) and one toxicologist, Professor Ian Kimber. What has BAAPS to say? The BAAPS has repeatedly warned (http://www.baaps.org.uk/about-us/press-releases/1460-analyse-this and http://www.baaps.org.uk/about-us/press-releases/1462-pip-implants-there-are-still-unanswered-questions) that there remain unanswered questions about the devices. I am afraid to say that our reaction is similar to the response you received from Sir Bruce Keogh in August (2012) to the extensive dossier you submitted following our meeting. There is nothing in the new material you have sent us which is unfamiliar to us and would justify reviewing the conclusions of Sir Bruce’s expert group. The fact that a substance such as the siloxane D4 requires a “hazard” label in its pure state, or in concentrated solution, does not mean that it is a significant hazard to health in the very small concentrations typically found in PIP implants, or for that matter in a range of consumer products. … the expert group took enormous care to set out a fair and balanced assessment of these risks. ABSTRACT: SCCP concluded in its opinion (SCCP/0893/05) adopted during the 6th plenary meeting of 13 December 2005 that “On the basis of provided data, the SCCP is unable to assess the risk to consumers when Octamethylcyclotetrasiloxane (D4) is used in cosmetic products. Despite the size of the dossier submitted by industry for evaluation, it is unfortunate that the dossier lacked meaningful information/data on actual consumer exposure to D4. The SCCS is of the opinion that cyclomethicone (D4, D5) does not pose a risk for human health when used in cosmetic products. Other uses were not considered in this risk assessment. This conclusion is based on the currently available in-use concentrations as cited in this opinion. It should be noted that D4 is classified as a reprotoxic substance, category 3 [ECB 2006]. The NOAEL for systemic toxicity (150 ppm) used for this risk assessment also covers reprotoxic effects (NOAEL = 300 ppm). The Commission Services should consider whether an environmental risk assessment associated with the use of cyclomethicone (D4/D5) in cosmetic products is required. Has anyone considered an environmental assessment? In 2012, the European Commission responded to PIP Action Campaign’s request for details of the classification of D4. This confirmed D4 as ReproToxic in humans with labeling exemptions in personal care products and High Risk Category III implantable Medical Devices. We were informed of the substance review and environmental evaluation of D4 underway by UK Competent Authority for REACH, HSE. HSE has confirmed that following the completion of this evaluation and the conclusion reached, EA is now working on a formal proposal for restriction on the basis of the environmental concerns. D4 meets the Annex XIII criteria in the environment what does it mean for my health? What did the Nina Cromnier, Chair of the Management Board ECHA, say about D4 and human health risk when we raised concerns? You are highlighting an important concern for the health and safety of citizens resulting from cyclic siloxanes D4, D5 and D6. The European Chemicals Agency (ECHA) is aware of the debate around these chemical substances. What is known about EDC’s and their effect on health? Who is most at risk from D4? So what about tests on breast milk SCENIHR? What about testing more than one subject & recommending urgent preventative removals of all non-compliant PIP implants? Who are these clinical experts? It cannot possibly be a big inconvenience to your day to have to test a few more samples of breast milk. The only reason I can see for your refusal is that you may have serious concerns as to the consequences of test results. If you found levels of silicone that were too high then this could lead to a higher volume of women demanding removal and this would cost more money. You have to ask yourselves exactly why you are here. If it’s to protect people then you should be wanting to gather as much information as possible so that you can be more reliable in your recommendations and protect women, their unborn babies and nursing babies. If you truly believe nursing with ruptured breast implants is safe then why not prove it by testing these samples? I do not know a single scientific study that can claim to be reliable from testing a single subject. It’s absolutely crazy, and potentially very dangerous. Is this the only evidence the SCENIHR Final Opinion is not being driven by scientific rigour? Because of the political and other concerns regarding PIP implants, there have been major efforts in several countries to assess the health implications of implant leakage and implant rupture. Much of this important work is not yet published in scientific literature. As a consequence the SCENIHR has deviated from its normal practice of relying almost exclusively on the published literature. Human health Repro. Cat 3 R62: Possible risk of impaired fertility. Human health Hazard class and category: Repr. 2. Hazard statement: H361f: Suspected of damaging fertility. D4 is categorized as an endocrine disruptor (cat 1). – D4 is found in silicone breast implants and in higher concentrations in criminally manufactured PIP breast implants. – Thousands of women with fraudulent PIP implants report immunological, neurological and endrocrinal symptoms. What conclusion has the SCENIHR reached? PIP ACTION CAMPAIGN calls on the European Commission to immediately withdraw the SCENIHR Final Opinion and initiate criminal negligence proceedings.